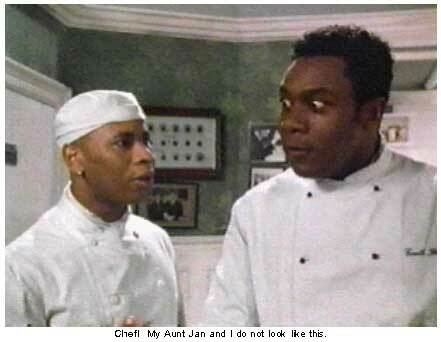 Not until I heard my epicurean Auntie Jan describe me as her sous-chef for Thanksgiving Day did I have any qualms about what I had signed on to do. Technically speaking, "sous-chef" is a French term which basically means second in command in a kitchen. French is the language of subtlety, intrigue, and smarty-pants insults (which I'm pretty sure is why Eye of Fatima is fond of it), so it's hard to take the second in command business at face value. Meanwhile, English, especially that spoken by English people, is blunt, direct; the language of the laser guided insult. At least it is in my primary source of information about what it's like to be a sous-chef in an ambitious kitchen, that is to say, on the British TV show Chef! If you haven't seen Chef! and live near me, you can catch it on Saturday nights at ten on channel eight. The rest of you are on your own, but it's worth seeking out this character who "swears like a Drill Sergeant with a Ph.D." and whose insults clock in at about a minute each. For Chef Gareth Blackstock, high praise is, "I think I have found someone in this kitchen who does not want to poison the customers." That was to his future sous-chef. More typical is, "Let me explain the order of things to you. There's the aristocracy, the upper class, the middle class, working class, dumb animals, waiters, creeping things, head lice, people who eat packet soup, then you." That was to a prep and clean-up staffer, the lowest member of any kitchen hierarchy. In my Aunt's kitchen, I would be sous-chef, second in command. However, that's mostly because I will be her only assistant, and therefore also the lowest member of the kitchen staff. Which Chef! approach would Auntie Jan take toward me? Based on the pre-meal strategizing session, I had to conclude that neither was correct. Not that it didn't start scary. When I called that evening, the first words out of her mouth were, "I know who you are. Now, where the hell are you?" It was a fair question, and one that insured I would break any number of speed guidelines on the 101. But to be sure, by the end of our conversation I was certain that I was racing toward a hot tub, and wine and cheese that was way too good for me. Boy, was that good cheese. Even confronted by the quality of the wine and cheese as well as my Aunt's long tradition of elaborate feasts, I still didn't grasp the gap between what she and I consider food to be. Maybe it was because I was busy trying to suppress the unsightly swellings in my three piece bathing suit caused (mostly) by Jacuzzi's jets, but my lone suggestion regarding the meal--that a small pile of uncooked sticks of vegetables might provide a nice little break in the large piles of cooked food, you know, like two or three inches of celery or carrot per person--turned out wildly different in practice. How different? Imagine a serving dish as large as my new blotter style desk calendar (or somebody else's if you haven't seen mine), filled with blanched artichokes and baby carrots (I thought I was doing well by skipping the primary definition of "blanched" as vegetables so frightened that they turn white, and asking if they were to be boiled until they turned white, but found out that blanching re plants means "lightly boiled" and nothing turns white, which I think is sort of misleading), topped with cherry tomatoes and sprinkles of some fancy schmancy cheese (but not as good as the Monday night stuff). But that happened relatively late on Thanksgiving Day. Early was 7:24 in the ever loving a.m. when I awoke with a splitting headache. To combat it, I did some light reading and some heavy drinking of coffee and ingesting of Ibuprofen, took a shower, and by the time I arrived (pretty much on time) at my vivacious Auntie Jan's house felt ready to face the pots and pans. Of course, once again, I had failed to understand what "pots" and "pans" might mean to her. In my house, it means either "the one" or "the smaller one." In hers, it could be one of dozens that pack her newly remodeled cupboards. Seriously, you've never seen so many of the damn things in a private home in your life. I wanted to take a picture, but she refused as long as they were in their naked state and unfortunately I didn't have the wit to document them when they were full of food. The cooking procedure itself was interesting, though I can't claim to have grasped the big picture. Causing the celery to be dirt free, that was all me, baby. But could I make gravy on my own? Not unless removing it from a jar and heating it counts. But my aunt's is really something. Whenever I put that many vegetables together, I call it a salad. Of the dish I was allowed to make without supervision, I neglected to include one of its five ingredients. And though that's a scant 20%, it was pretty significant volume-wise. Fortunately, it hadn't been in the cook-box thingie long, and Aunt Jan pulled it out and made the correction without any problem. Also, I learned that her dog Tough can conceal an entire lemon in his mouth, and if you order him to drop it he couldn't care less. But I'm taking baby steps, and that should eventually get me somewhere, even if the first stop isn't gravy or twenty lb turkey. I have a proven competence in simple tasks like peeling potatoes (even if I lose the occasional fingernail in the process) and melting butter in the microwave. And simple tasks were all I was up to later that afternoon when mealtime rolled around because my headache had mutated into an Ibuprofen proof strain. Could I put stuff in bowls? Yes. Could I hold up my end of a conversation? No way. To be fair, I don't think any of the guests really noticed a difference. So I nagged Aunt Jan to assign me little chores, which were continually frustrated by Danny telling me to put down those dishes for crying out loud because Mary Jane would be up at 5:30am to do yoga but dishes would be better for her or something like that. It's kind of a blur. The important thing is I've had an invaluable experience in a top notch kitchen, and if you ever need a mushroom washed or a can opened, I will be so there.